...for United Performance Metals, a service center that, with its new cut-to-length line, can supply stainless-steel blanks more quickly and with tighter tolerances than ever before. For automotive, appliance and more, the Southeast United States has become a hot bed for metal-product production, and states like Alabama and Mississippi are leading the . Rome Tool & Die stamps flatter parts, conserves material and enhances operator safety by installing a new coil-feeding system. 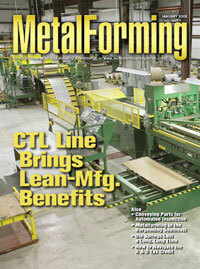 Customer satisfaction goes through the roof for metalformer Tella Tool & Mfg. after the firm integrates automated inline visual inspection--with portable, custom conveying solutions--of challenging stampings. Read on to find out how your company can estimate its potential cash benefit from an R&D credit, which can be some serious money, and go about getting it. With a surge in the use of multiple-out dies, and a 25-percent increase in the number of tools being run in their stamping plant, Oberg's die maintenance group looked for a spring solution to keep the tools in the presses longer between maintenance cycles. The answer came with an upgrade to chrome-silicon die springs. Do You Use 1008/1010-Grade Steel?